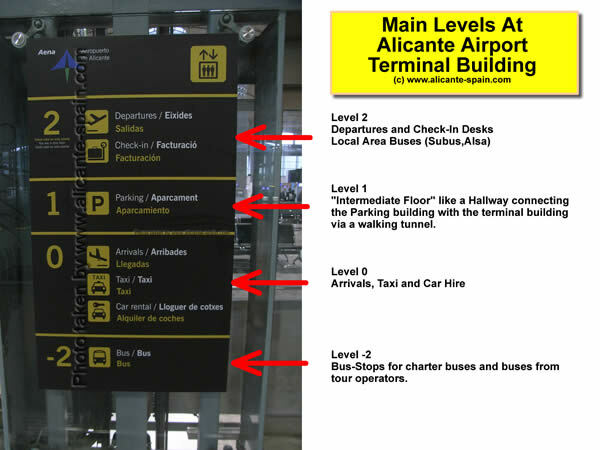 When you arrive at Alicante airport for the first time and try to figure out how to get a bus to Alicante , Benidorm, Calpe , Elche, Murcia or other cities around the Costa Blanca, the bus stop area at the airport can be quite confusing. To say it in a more direct fashion – Alicante Airport got one huge BUS parking area just outside of the lower floor -2 , but this is for charter Buses and tour operator buses only. 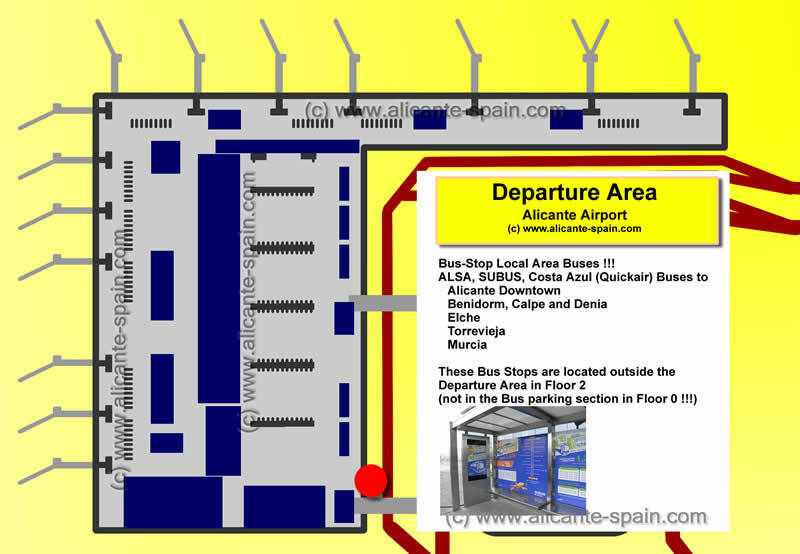 The Bus Stops for local area buses (from Alsa, Subus, Costa Azul – Quickair, Baile ) to Alicante, Benidorm, Denia, Santa Pola, Torrevieja, Murcia and Elche are located at the very end of the terminal building at departure level. Again, to make this very clear: Local buses to Alicante, Benidorm, Torrevieja, Denia, Murcia, Santa Pola and Elche do Stop only outside the Departure Area (Level 2). These bus-lines do NOT stop at the lower “bus” level of the airport. 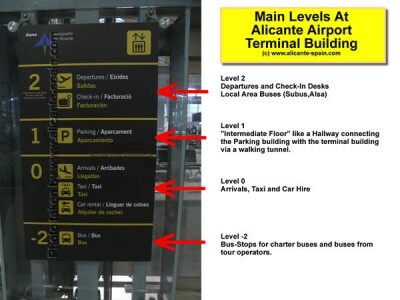 Where do I catch my bus at the airport of Alicante? Exiting the arrival gate ( Level 0 ) you walk straight on to the elevators. Take the elevator UP to the Departure level. ( Do NOT go down to the arrival level, as this is for charter busses only). At the departure level 2 you walk to the very end of the departure area and exit the terminal building. There they are: All bus-stops for local area busses to Alicante, Benidorm, Torrevieja etc are right outside the departure area. 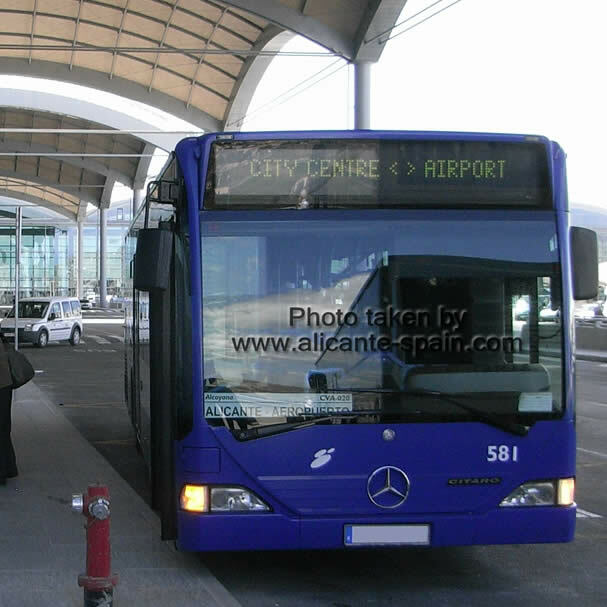 Alicante Airport has one so called “Airport – to – Alicante City” bus line. 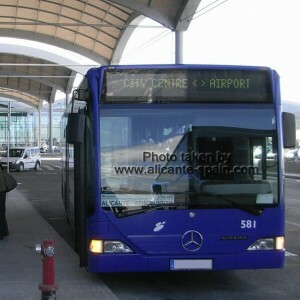 The bus is marked in spanish ” Centro Ciudad <> Aeropuerto ” and runs multiple times during the day. Timetable – well… see below.. but … hardly ever worked our for me – comes usually every 20 Minutes to pick you up at the airport. So if you lucky – it is right there, if not… well – enjoy the sun! Air-Conditioned – well sort of, sometimes it works – sometimes it doesn’t – but it’s fun! Bus Driver – Please don’t worry! A spanish bus driver might not speak English or German, but if you ask for “Estacion de trenes” (Train Station) – he will tell you when to leave the bus! – do not get impatient it will take 40 minutes! It’s only a few stops from the airport to the Bus stop right in front of the new Alicante Central Bus station or terminal, where busses to all major areas of the Costa Blanca and Spain are leaving! 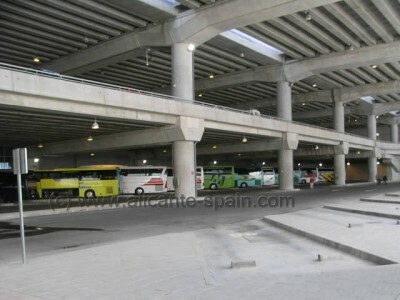 In case you want to ask the bus driver… “Bus terminal or station” is called “Estacion de autobuses” in spanish. 🙂 – Attention this is the stop to the NEW Bus station in Downtown Alicante (opened in Sept. 2011) harbor area. The next bus stop if you drive from the airport is the downtown bus stop at “Plaza Puerta del Mar” which gets you to the harbor area where various great hotels in Alicante are located. 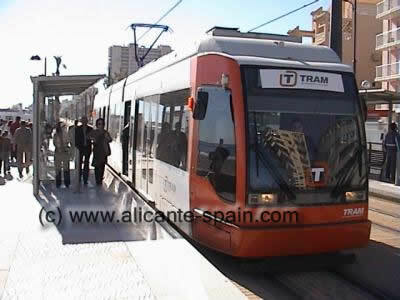 Its also a good starting point if you want to board a Alicante streetcar ( TRAM ) for any further traveling to nearby cities at the northern Costa Blanca region To catch the Tram from here to cities like Benidorm, Calpe etc, you will need to change tram line. Better to stay on the bus and drive to the Bus station at Plaza de los Luzeros to board the direct Tram lines to the Costa Blanca. Your best connection to get on the Streetcar (TRAM) to the northern Costa Blanca is at the bus stop at Plaza de los Luceros. You can walk a couple of meters to the Luceros Underground Streetcar station. 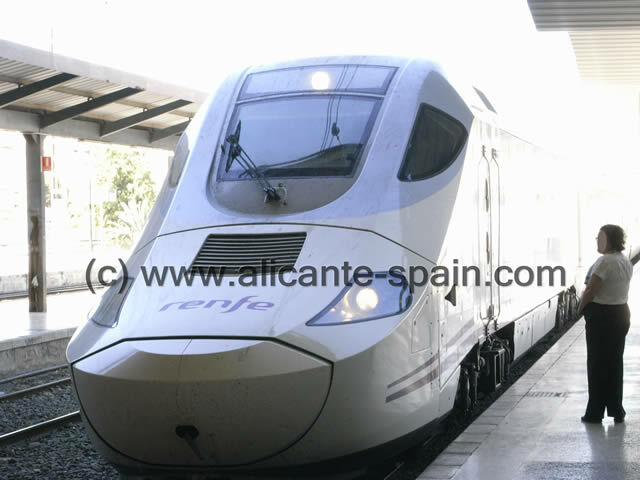 To board a train at Alicante train station you can exit the Alicante airport bus after you have done a entire “loop” around the city. The bus stop is right outside the train terminal just couple of feet away. Runs all year… frequent daily buses, basically every 20 minutes until late at night. Go to bus stop 30 (it is really just 1 Minute from the arrival building), have a look how many people are already waiting and ask for how long they are already standing around in the sun. In case nobody is waiting, you know that the bus just left – and you might have to wait 20+ minutes. – Depending if you travel in a group you might want to reconsider taking the Alicante Airport Bus, and perhaps better take a Taxi from nearby. A new direct Bus line from Alicante Airport to Benidorm has been installed. It leaves also from Bus stop outside of the departure level of Alicante airport. More details, timetable and pricing here. For those visiting the world capital of palm trees the city of Elche, this is good news. The spanish bus company Subus runs a bus service from Alicante Airport to Elche. Details here. 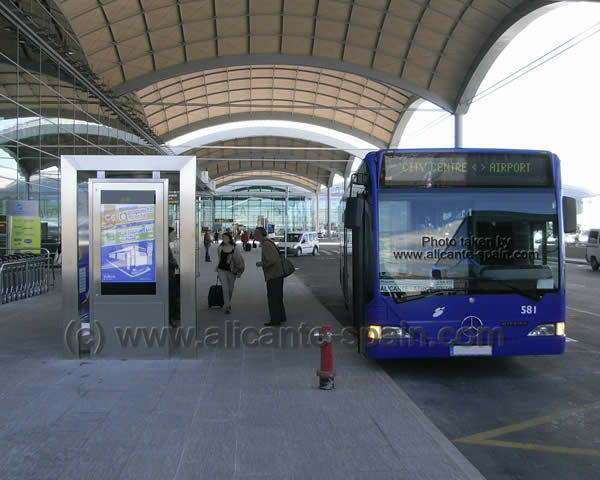 Visitors to the city of Murcia find a direct bus service run by the Alsa bus company from Alicante airport. 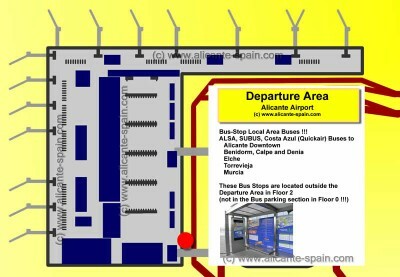 Details on the Murcia to/from Alicante Airport bus here. 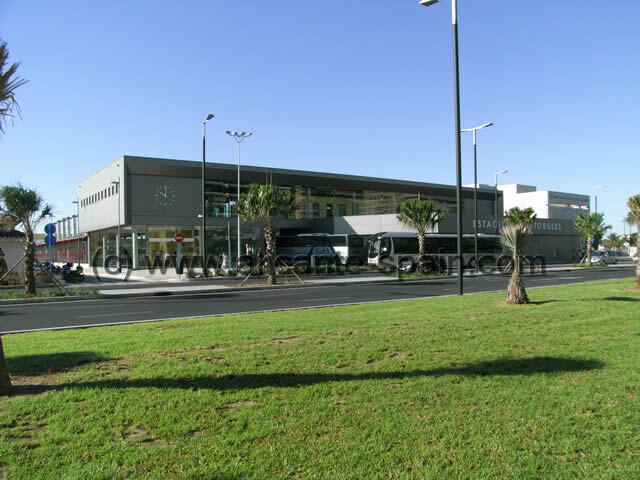 Daily direct bus service between the airport and Torrevieja is available. Details about the timetable and how to get to Torrevieja by bus from Alicante airport can be found here. 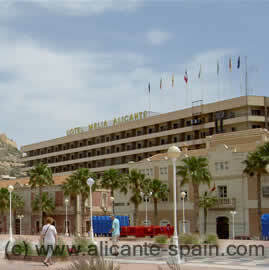 The final busstop is the downtown bus stop at “Plaza Puerta del Mar” which gets you to the harbor area where various great hotels in Alicante are located. 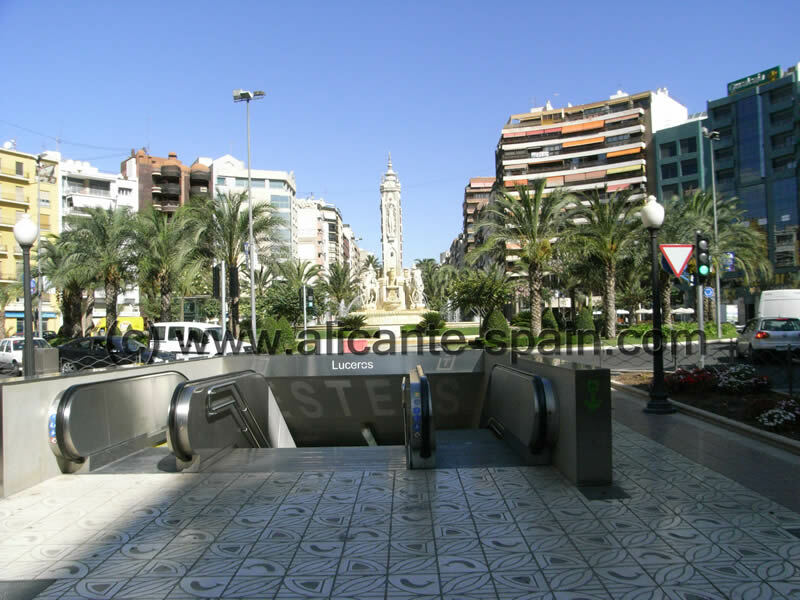 Its also a good starting point if you want to board a Alicante streetcar ( TRAM ) for any further traveling to nearby cities at the northern Costa Blanca region.